Apple promised last week to release a software update to address a location tracking bug in its iOS mobile operating system, and a pre-release build of iOS 4.3.3 indicates the company is acting quickly to release the update. 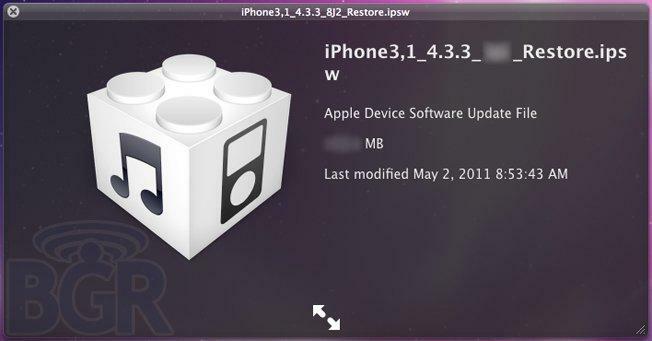 The early build of iOS 4.3.3 was sent on Monday to Boy Genius Report. The site said that the update will likely be issued within the next two weeks, but possibly even sooner. Sources reportedly told the site that after installing the update, iOS 4 will no longer back up the location database file, "consolidated.db," to iTunes when a user syncs their iPhone or iPad 3G. Apple will also, as promised, reduce the size of the file and limit the length of time that location data is stored. Also as promised, the update will reportedly delete the database file when users choose to turn off Location Services on their iOS-powered device. In addition to addressing the location data controversy, the update is also said to include battery life improvements, and fixes for bugs related to the iPod software. Last week, Apple issued a statement in response to growing concern over a bug in iOS 4 that stored a database of up to a year's worth of Wi-Fi hotspot and cell tower locations. Apple said they don't think the iPhone needs to store more than seven days worth of such data. The company also said that the data should not be collected when users turn off Location Services on their iPhone, and the fact that it was being stored was a bug. The company said that it would release a software update "in the next few weeks" to fix the bug, stop backup of the database file, and reduce the size of the file and scope of the information stored. Apple also promised that its next "major" iOS software release would encrypt the file on the iPhone, ensuring that the data could not be obtained by a third party for illicit purposes. The iPhone maker was forced to speak out on the issue after concern over the location data reached a fever pitch. The controversy prompted lawsuits, government investigations around the world, and a scheduled hearing on mobile privacy in the U.S. Senate, set to involve both Apple and Google on May 10.